It was our wedding anniversary at the beginning of the month and The Hubs and I had a night to ourselves which was lovely. Rather than go out, we decided to stay in a cook a nice meal, the only problem was that we very rarely agree on meals and we wanted something quick, easy and delicious to make. 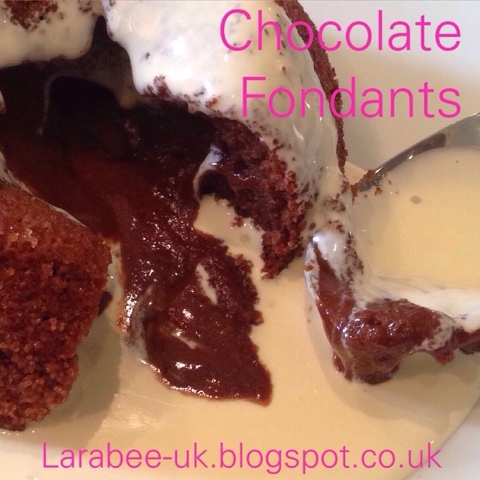 I found a recipe on pinterest for chocolate fondants and in true Larabee style I adapted it to suit us and this is what we ended up with! They were delicious and had a very thin layer of sugar coating which was gorgeous and ours were just the right size for 2. The measurements are so basic it would be easy to double or treble if you needed to - I've promised the kids we'd make this for them next time they are round. 1. Preheat the oven to 220oC. Grease 2 muffin tins with butter and coat the butter with the granulated sugar, tip out any excess. 2. Melt your chocoalate, we used the microwave on bursts of 30 seconds but you could do this over a pan. 3. Cream together the butter and the sugar using an electric whisk. 4. Add the eggs and beat until mixture starts to foam. 5. Add the flour and continue to beat until combined. 6. Mix in a little chocolate with a spatula - don't add it all in one go as it's still hot and you do not want to cook the egg. 7. Fold in the remaining chocolate until thoroughly mixed, divide between the muffin tins. 8. Bake in the oven for 12 minutes until the top is set and you can see the sides coming away from the tin. 9. Leave for 5 minutes, then turn out onto a plate, I was amazed that they came out of the muffin tins with ease, I just held an oven glove over the second one whilst I was tipping out the first, which worked well. And that's it, we served with just cream and they really were delicious, and a lot quicker than the method above looks! Our main course for this meal was delicious too, you can find our beer battered halloumi recipe here. I've always wanted to try these out but was worried they would not stay liquid in the centre.